New Zealand have put one foot in the semi-finals after a 14-0 trouncing of Tonga in the day’s opening Group A match of the OFC U-19 Championship at Stade Pater this afternoon. Tahiti then put in a much improved collective performance to take a 6-0 win over Papua New Guinea in front of a vocal home crowd in the evening encounter. Hoping to deliver another solid performance like their opening 45 against Papua New Guinea, Tonga came out buoyant and ready to deliver. However the mood quickly turned when keeper Sionela Lui slipped, allowing Robert Tipelu to finish into an empty net in the 15th minute. 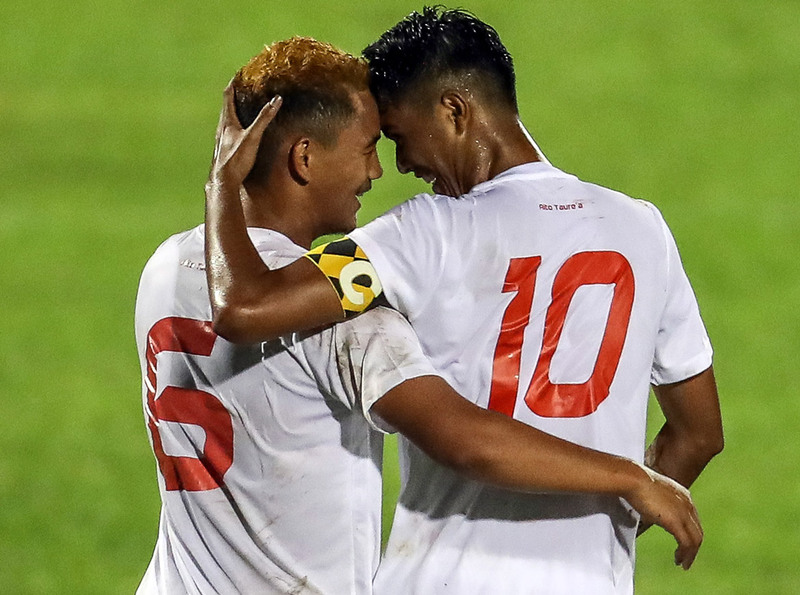 Conceding such an unfortunate early goal seemed to dampen Tongan spirits and it was all downhill from there for the Polynesian side as they struggled to hold up to the onslaught from their more experienced opponents. Leading by example, New Zealand captain Joe Bell scored a hat-trick in the space of five minutes to help his team to a commanding 5-0 lead at the break. He was unlucky not to add a fourth when he netted at the far post, only to be judged offside by referee Salesh Chand. New Zealand made two changes coming into the second half, including bringing in Olivier Whyte who had no intention of wasting the opportunity. He scored twice in quick succession after the restart, and added a third in the 89th minute to join his captain on a hat-trick. Dane Schnell scored either side of the break while Charles Spragg had brace in the space of five minutes before he notched his third two minutes from time completing a hat-trick of hat-tricks for New Zealand. The frustration grew for Tonga as Jordan Spain and Boyd Curry took the tally to 14, with Tuia Falepapalangi receiving two cautions and his marching orders with just under ten minutes remaining in the match. New Zealand coach Des Buckingham gave credit to his players for a very professional display. “Full credit to the players they enjoyed themselves and they showed what they were capable of doing,” he said. The result means the defending champions lead Group A with six points from two matches as they head into a final group game against Papua New Guinea coming up on Saturday. Despite a heavy defeat, the second loss in two matches for the Qualifier winners, Tonga coach Soane Mailangi opted to take some positives from the game. “Like I said this is an opportunity for my players to play against New Zealand,” he said. “After our time in the Cook Islands we knew this level was going to be hard. Moving on to the anticipated second match, the host side Tahiti made a strong statement when Terai Bremond scored in just the second minute of play following a scramble in the goal mouth. Papua New Guinea attempted to hit back just as quickly, forcing a save from goalkeeper Moana Pito in the 6th minute, but Tahiti were much more threatening with the speed of their counter attacks and build-up from the midfield putting their opponents on the back foot. Tahiti captain Roonui Tehau got on the scoresheet in the 17th minute when he leapt high at the near post to connect with a corner delivery, heading it past keeper Graham Berigami. Bremond then added his second with an absolute rocket from the edge of the area, before Yann Vivi sent a ground-grubber past Berigami for Tahiti’s fourth. Tahiti continued to apply pressure as they came back from the break and had a couple of early opportunities just go astray. Papua New Guinea also came out determined to try and pull themselves back into contention and they came close with a chance to Jonathan Allen forcing Pito into action. Despite their best efforts, the Melanesian side couldn’t hold off the onslaught from their opponents and Eddy Kaspard was soon adding a fifth to the tally. The match took a sour turn after that as Solomon Islands referee was forced to dish out three red cards for Dopson Noi, Sylvester Luke and Kimson Kapai, while Tahiti’s Hennel Tehaamoana was given a caution after a ruckus broke out on the field. In addition, Tahiti’s Samuel Liparo had to be stretchered off after taking a punch to the back of the head during the incident. With Papua New Guinea now down to eight men, Tahiti had an opportunity to put the match to bed, and it was captain Tehau who tried to lead by example with an 86th minute goal. He was replaced by Purutu Nanuaiterai on the stroke of 90 minutes, with ten minutes of added time to play, but the substitute didn’t last long in the game receiving a red card after just two minutes of game time. Tahiti had a couple of last gasp chances to extend their lead but Berigami made certain that didn’t happen, with the match rounding out with a 6-0 win for the home side. Papua New Guinea coach Harrison Kamake said he was disappointed his boys could not build on from opening day win against Tonga, with the second half incident also leaving a sour note. “Obviously I am really disappointed with their actions and I’m disappointed with the result,” he said. Tahiti coach Bruno Tehaamoana was more than happy to get three points on the table, with one final match remaining for them to stake their claim on a spot in the semi-final. “Congratulations to my boys. The first half we managed well and we scored some goals which was good, afterwards the second half we let go somewhat,” Tehaamoana said. However he indicated that the second half wasn’t an equal showing from his side as they allowed themselves to be drawn into Papua New Guinea’s web. “We allowed ourselves to fall into the game of the Papua New Guineans because they harassed and harassed the ball carriers when we were in possession. They had nothing to lose, they were already 4-0 behind. “They tried to shove us off our game and they succeeded. I think the match was over when they had their three players sent off. “I’m really disappointed in the image that we had at the end of the match,” he concluded. Match Day 4 of the OFC U-19 Championship will take place tomorrow when Group B returns to action with Solomon Islands taking on Fiji and New Caledonia meeting Vanuatu. The matches will all be at Stade Pater, a change from what was earlier advertised.